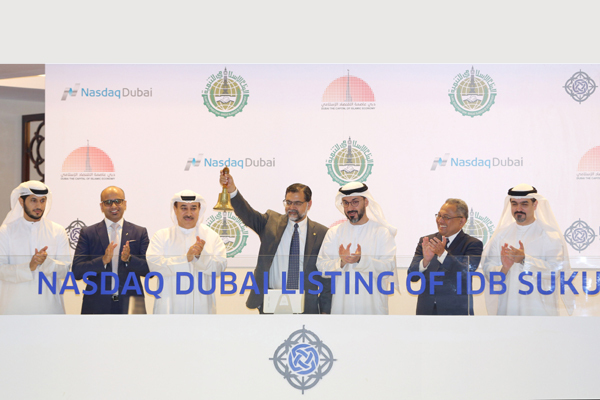 Islamic Development Bank's (IDB) VP Finance and chief financial officer Dr Zamir Iqbal rang the market-opening bell to celebrate the listing of a $1.25 billion sukuk on Nasdaq Dubai, the region's international financial exchange. The listing supports the economic development and social advancement goals of IDB, an AAA-rated multilateral institution, whose activities include providing financing for development projects in line with Sharia'a principles to its 57 member countries. The geographical distribution of investors show strong demand for IDB Sukuk, where fifty-three per cent of the five-year Sukuk issuance was acquired by investors in the EMEA region, while 47 per cent went to investors based in Asia, with an annual return of 2.261 per cent. The IDB is one of the largest Sukuk issuers on Nasdaq Dubai, with a current total of eight listings valued at $10.25 billion. The bell-ringing ceremony was attended by Hamed Ali, the exchange's chief executive, as well as Azahari Bin Abd Kudus, Capital Markets Manager of the IDB. On the sukuk listing, Dr Iqbal said: "As the IDB increases its support for member countries in sectors ranging from infrastructure and agriculture to schools and hospitals, it is critical for us to raise capital in a cost effective, efficient and timely manner." "We appreciate the support of UAE in helping us promoting development in member countries. Our listing on Nasdaq Dubai, as the region's international financial exchange and a leading venue for Islamic securities, is a testimony of investors’ confidence through its robust infrastructure and regulatory environment, and global network of market participants," he stated. Abdul Wahed Al Fahim, the chairman of Nasdaq Dubai, said the IDB's latest sukuk listing underlines its close relationship with Dubai and is another significant step in the growth of the emirate as the global capital of the Islamic economy. "We are delighted to make Dubai's Islamic capital markets infrastructure available to the IDB in order to facilitate its beneficial economic and social activities," remarked Fahim. Dubai is a leading international centre for Sukuk activity, with Sukuk listings in the Emirate currently totaling $52.47 billion. Ali said: "As an established listing venue for Islamic securities issued by leading multilateral financial institutions, Nasdaq Dubai is delighted to welcome this latest Sukuk from the IDB as the bank continues its valuable work around the globe."